Genuine OEM Lexmark Toner Cartridge, Yellow, Extra High Capacity 5,000 page yield. Lexmark part number: 78C1XY0. Color Laser Toner Cartridge compatible with Lexmark CS421dn, CS521dn, CS622de, CX421adn, CX522ade, CX622ade, CX625. Genuine OEM Lexmark Toner Cartridge, Cyan, 1,400 page yield. Lexmark part number: 78C10C0. Color Laser Toner Cartridge compatible with Lexmark CS421dn, CS521dn, CS622de, CX421adn, CX522ade, CX622ade, CX625. Genuine OEM Lexmark Toner Cartridge, Cyan, Ultra High Capacity 7,000 page yield. Lexmark part number: 78C1UC0. Color Laser Toner Cartridge compatible with Lexmark CS521dn, CS622de, CX622ade, CX625. Genuine OEM Lexmark Toner Cartridge, Cyan, Extra High Capacity 5,000 page yield. Lexmark part number: 78C1XC0. Color Laser Toner Cartridge compatible with Lexmark CS421dn, CS521dn, CS622de, CX421adn, CX522ade, CX622ade, CX625. Genuine OEM Lexmark Toner Cartridge, Magenta, 1,400 page yield. Lexmark part number: 78C10M0. Color Laser Toner Cartridge compatible with Lexmark CS421dn, CS521dn, CS622de, CX421adn, CX522ade, CX622ade, CX625. Genuine OEM Lexmark Toner Cartridge, Magenta, Ultra High Capacity 7,000 page yield. Lexmark part number: 78C1UM0. Color Laser Toner Cartridge compatible with Lexmark CS521dn, CS622de, CX622ade, CX625. Genuine OEM Lexmark Toner Cartridge, Magenta, Extra High Capacity 5,000 page yield. Lexmark part number: 78C1XM0. Color Laser Toner Cartridge compatible with Lexmark CS421dn, CS521dn, CS622de, CX421adn, CX522ade, CX622ade, CX625. Genuine OEM Lexmark Toner Cartridge, Yellow, 1,400 page yield. 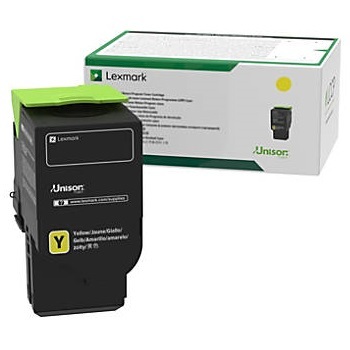 Lexmark part number: 78C10Y0. Color Laser Toner Cartridge compatible with Lexmark CS421dn, CS521dn, CS622de, CX421adn, CX522ade, CX622ade, CX625. Genuine OEM Lexmark Toner Cartridge, Yellow, Ultra High Capacity 7,000 page yield. Lexmark part number: 78C1UY0. Color Laser Toner Cartridge compatible with Lexmark CS521dn, CS622de, CX622ade, CX625. Genuine OEM Lexmark Toner Cartridge, Black, 2,000 page yield. Lexmark part number: 78C10K0. Laser Toner Cartridge compatible with Lexmark CS421dn, CS521dn, CS622de, CX421adn, CX522ade, CX622ade, CX625. Genuine OEM Lexmark Toner Cartridge, Black, Ultra High Capacity 10,500 page yield. Lexmark part number: 78C1UK0. Laser Toner Cartridge compatible with Lexmark CS521dn, CS622de, CX622ade, CX625. Genuine OEM Lexmark Toner Cartridge, Black, Extra High Capacity 8,500 page yield. Lexmark part number: 78C1XK0. Laser Toner Cartridge compatible with Lexmark CS421dn, CS521dn, CS622de, CX421adn, CX522ade, CX622ade, CX625. Genuine OEM Lexmark Imaging Unit, Cyan, 125,000 page yield. Lexmark part number: 78C0D20. Imaging Unit compatible with Lexmark CS421dn, CS521dn, CS622de, CX421adn, CX522ade, CX622ade, CX625. Genuine OEM Lexmark Imaging Unit, Magenta, 125,000 page yield. Lexmark part number: 78C0D30. Imaging Unit compatible with Lexmark CS421dn, CS521dn, CS622de, CX421adn, CX522ade, CX622ade, CX625. Genuine OEM Lexmark Imaging Unit, Yellow, 125,000 page yield. Lexmark part number: 78C0D40. Imaging Unit compatible with Lexmark CS421dn, CS521dn, CS622de, CX421adn, CX522ade, CX622ade, CX625. Genuine OEM Lexmark Imaging Unit, Black, 125,000 page yield. Lexmark part number: 78C0D10. Imaging Unit compatible with Lexmark CS421dn, CS521dn, CS622de, CX421adn, CX522ade, CX622ade, CX625.